Last year I started thinking about that quilt. I thought I would like to make a double wedding ring but I didn't want it to have a bunch of flower fabric in it as in the one I bought. I also wanted the rings to be bigger. I am a trained drafter and I have always created my own patterns for all my assorted hobbies! So I went to work drafting rings in the AutoCAD program I use. I really had no idea how the original wedding ring patterns were created but I am pretty good at analyzing patterns. After I had finished the pattern and printed the templates, I had my husband make me some acrylic templates for me to test out. Did I tell you I had no idea how to sew one of these together? I think you can see my first attempt in an earlier post. Now I am pretty good at piecing them! I have had lots of practice! The rings on this quilt are 24". I think that is the biggest I have ever seen in a quilt of this type. I add the clam shell border pieces to the wedding ring because I wasn't fond of the way it looks without them. The quilting on the quilt was done by me also. I created the digitized pattern for the centers and converted it to a format usable in my longarm. The arcs and cornerstones were done free hand and a small part of the centers. 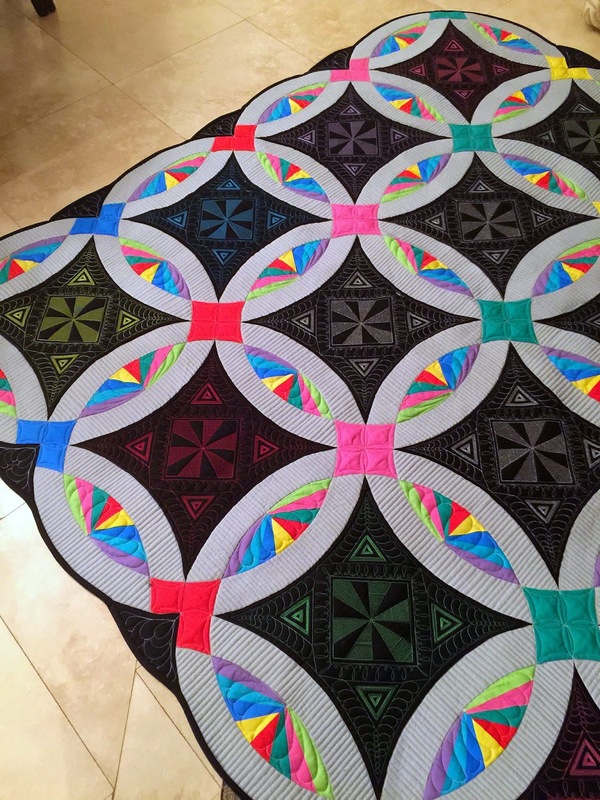 It took about 30 hours to quilt this quilt! I was so ready for it to be done! I have added the pattern to Craftsy if you would like to make your own. You can order the acrylic templates from me by emailing me at the address in the pattern. 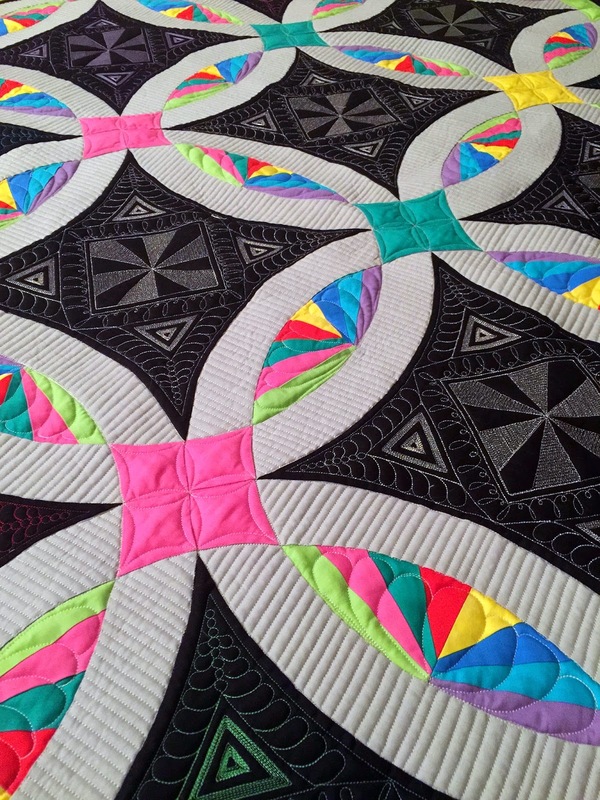 I absolutely love this quilt - the colors, the design - a traditional pattern with a new modern look - I love the quilting design - you really nailed this one. I just had to comment - I saw this on the quilting board originally and had to get another look - I hope you sell a lot of patterns with this one - perhaps you should make one for a quilt show? I think you have a winner. Thank you your comment really made my day! I saw this on craftsy, but your links for the blog are wrong there - found you through goggle. This has to be one of my most favorite quilts that I have ever laid my eyes on. As a Civil War fan with a family full of master quilters, that is saying quite a lot. Even though this is totally outside of my normal style (my home is filled with dark colors and everything old), I do believe I would redecorate to showcase this kind of talent. The quilt shows even better in person. Beautiful, Debra! Thank you Kystina. I actually thought it was why too modern for most people at the quilt when I showed it. I love this quilt!! How might you adapt the pattern for a King or California King? Laura, you can simply add two rows side and bottom.